Intu unique customer experience, the world’s first giant bridge floor piano. The Customer Experience team at intu wanted do something special at their Watford Centre for Christmas. Something that would set them apart, that would bring a smile to shoppers' faces and inspire them to talk about their experience with their friends and family. Following a full rebrand, intu also wanted to use this platform to help promote this to their customers. In addition, intu wanted a range of ideas that were seasonal and potentially longer term which would not only provide customers with something to enjoy and talk about, but also deliver the brand message and drive social media and brand interaction. The world's first giant bridge floor piano project was the perfect way to deliver this. 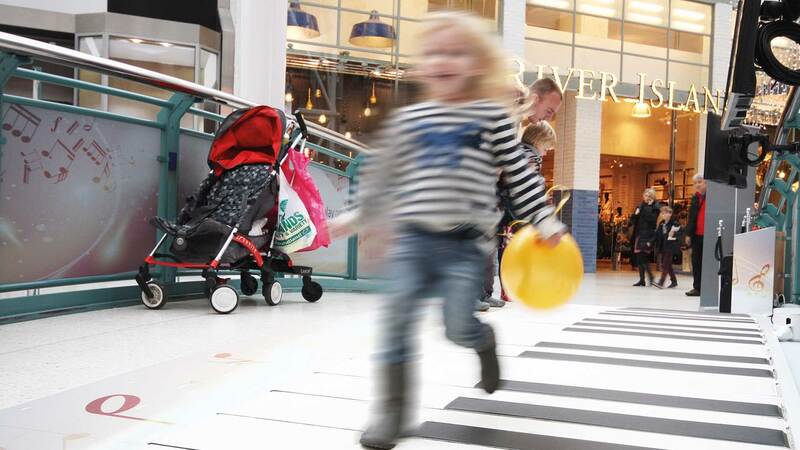 intu Watford has a Feature Bridge within the Centre, and this proved to be a perfect location for our giant floor piano. Floor pianos have been used before (usually on stairs) but never on a bridge. 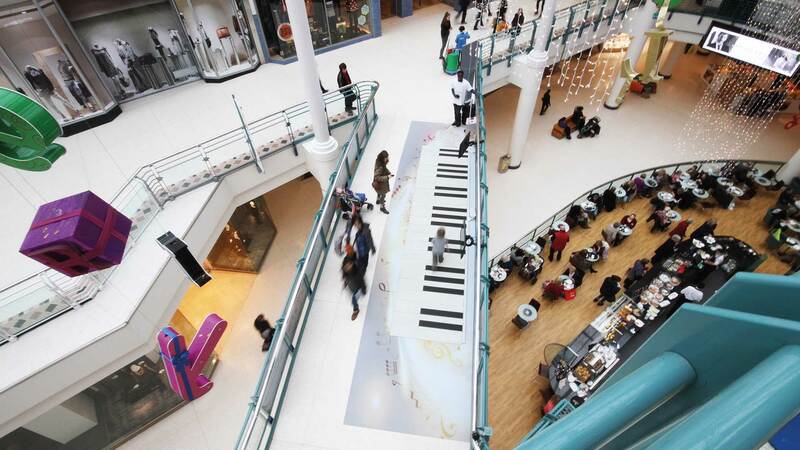 This six metre-long fully working keyboard and bespoke software invited shoppers to interact with the 'keys' by providing them with a visual guide on how to play songs. The piano was linked to a camera that let players take a picture and publish them to the intu Watford Twitter account. The installation was complemented by graphics that Livewire designed, printed and installed that helped to frame the experience and bring it to life. The piano was installed in early December and was in situ for six weeks. It was active for 42 days and on average 11.5 hours per day – 80.5 hours per week in total. The counter showed a dramatic increase between 2pm and 7pm. Anamorphic graphics were designed and installed into two of the Centre's lifts to give the illusion of wintery 3D scenes when the lift doors opened. The aim was to create a ‘wow’ factor that would get people smiling and talking.